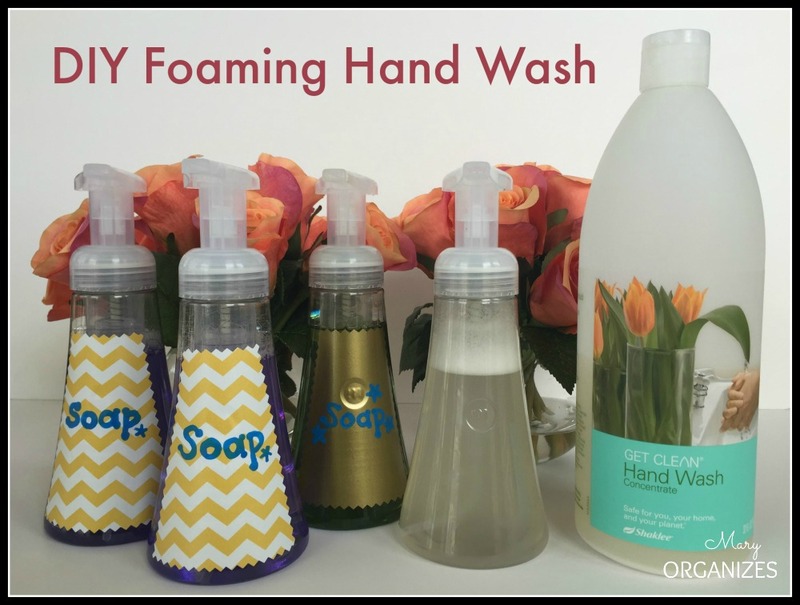 I prefer foaming hand wash for any soap dispensers in my home that might be used by my kids, though if I’m being honest, I like to use it too. I’ve watched my children put soap on their hands many times. It goes something like this: They pump a dollop of soap onto their hands and then without much movement to spread that soap around their hands and create suds, they target the “soap spot” with the water and rinse that spot off. When my kids wash their hands with foaming soap, they seem to more instinctively understand to rub that foam all around their hands! It just makes me feel more confident that their little hands are getting clean. When I figured out how to make my own foaming hand wash mix, I started saving a lot of money because the recipe uses a fraction of hand wash concentrate. With 6 people in our family and plenty of guests, I want to make our hand wash stretch as far as possible while also encouraging frequent hand washing. 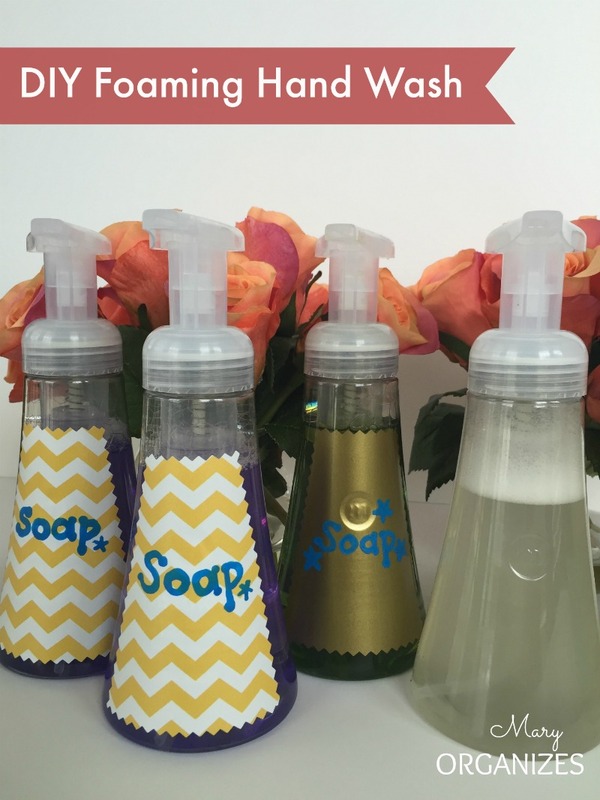 Start with a soap dispenser and bottle that has the awesome foaming ability. Put the pump/cap on the bottle and shake. You are ready to have awesome foaming hand wash! I recommend Shaklee’s Hand Wash Concentrate because it is completely safe for even the tiniest hands in your house and feels amazing. The foam bubbles feel silky and spa-like. You can order it from my Shaklee distributor website HERE. 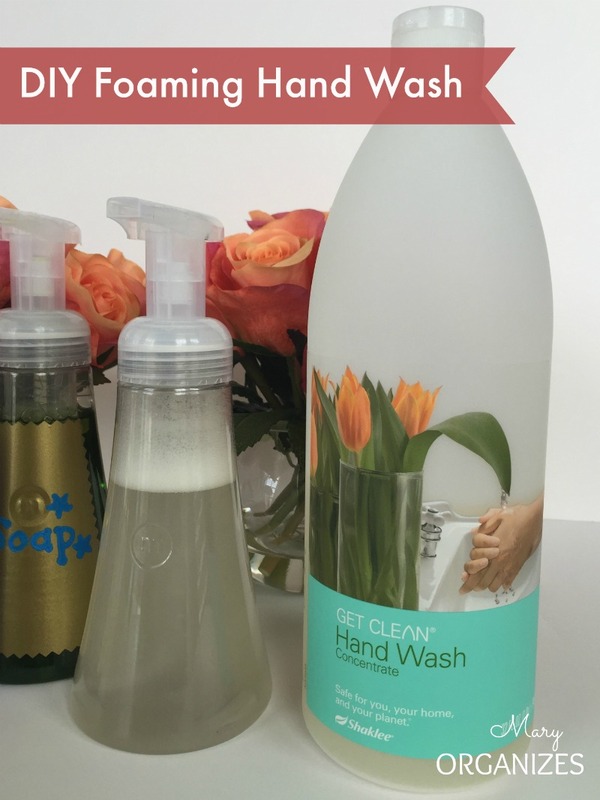 The big refill bottle will last forever now that I’ve found a way to use it in foaming hand soap! 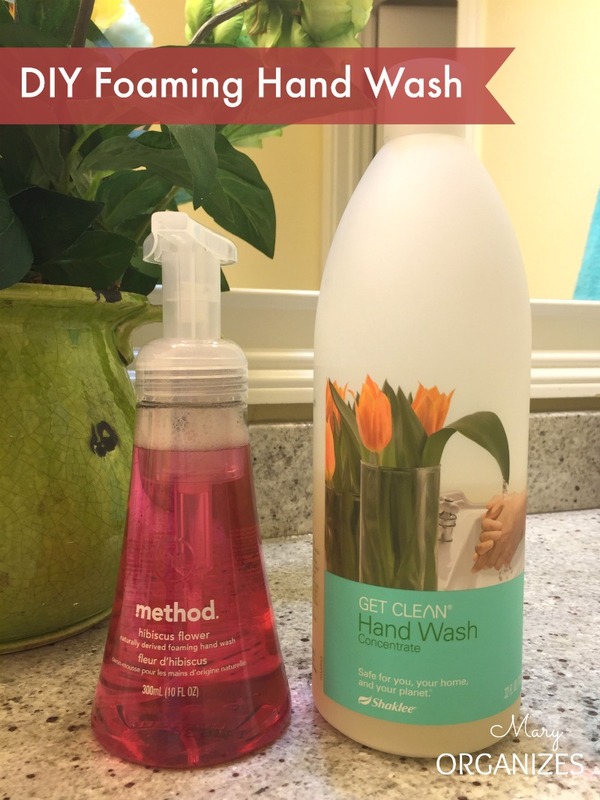 I love finding a way to use my favorite products, but save money in the process! Okay, and you know I care about random things like how the hand wash dispensers look, so I put a little vinyl on a few of them, though I left the one for my kitchen sink plain. Here’s to cleaner and happier hands! This is great Mary! Thank you. Does the dispenser have to be a certain kind? May I ask where you found your dispensers? Great idea, Mary! I just bought the replacement soap for my foaming dispenser, but when it’s gone, I want to make my own. Does Shaklee make a soap concentrate that also kills germs & viruses? That’s the kind of soap I’m using since my husband is on chemo. I’ve been refilling foaming hand soap dispensers myself for years. I use Meyers clean day hand soap and mix it at about the ratio you mention. however, the hand soap dispensers are starting to get grimey on the inside….do you have a tip on how to keep those clean? I wonder if the grimy insides have anything to do with the soap itself? Seems to me that soap containers shouldn’t need cleaning on the inside … but I don’t know, as I’m still at the beginning phase with mine and that hasn’t happened. Maybe try to clean and dry them out in between refills? How did you make the labels? I’m not familiar with using vinyl, but it sounds awesome! You can buy vinyl from craft stores. It is basically a sticker where the sticker is powerfully sticky and made out of vinyl. I just cut it the right size to fit the bottle. So easy! The fun colors are actually the original foam soap in the bottles. I haven’t experimented with it, but I’m wondering if you could infuse a small piece of fruit that might add color? Hmmm … I need to think on this one.